You'll find dice art in different kinds of formats, including tattoos, clip art, pictures and paintings. There are even performers using the name "Dice", so I'll include performance art too. Given their long history, I'm not surprised that dice are so popular in the art world. They can have a variety of meanings, such as: Good fortune or bad, gambling, fate or taking a risk. Dice tattoos are popular and often paired with playing cards or other gambling elements in a design. If you are not so adventurous, you may seek out a less permanent type of wearable art like jewelry or clothing. Since you're using a computer right now, you should know that dice clip art thrives in the digital world. The Microsoft art gallery offers several free choices if you're using Microsoft office software. Pictures of dice capture their appeal in popular culture. The Internet offers some good pictures of ancient dice too. Pictures of fuzzy dice are especially popular for their simplicity and nostalgia. You can find several good photos of dice, like the one below, at Art.com. Before photography, there was (and still is) painting. Painting isn't a lost art just because the world is going digital. Artist Michael Godard paints stunning (and very cool) works of art about gambling, poker, drinking and other popular sins. Below are several prints of Michael Godard's works that contain dice art. Painters from previous centuries painted scenes of people playing dice instead of dice by themselves. The paintings usually show men or boys playing the game indoors or in the street. There are even some artists creating dice art mosaics using hundreds or thousands of actual dice. I find it incredible how dice continue to inspire the creativity of artists in new ways. Stained glass dice provide another example of gorgeous dice art. The glass work captures the beautiful colors and shape of real dice. The photo below shows the completed work of the artists at Atlantean Artifacts, which was sold online at Etsy until October of 2008. Let's hope the artist makes more soon! Update! Another Etsy artist, DiceyDecor, is now selling stained glass dice. 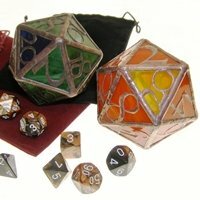 I've found another stained glass artist making dice. These stained glass dice are custom and handmade. The artist has also created an entire set of dice complete with numbers on each side. The name, or stage name, "Dice" is popular among performers. Given the allure of dice and close association with risk, luck and gambling, this isn't a surprise. Comedian Andrew "Dice" Clay uses the nick name. In music, the duo Dice and K9 of Mobbstarr are popular performers from the Philippines.